Canadian captain Max Comtois played with a separated shoulder at this year's world junior hockey championship, the Anaheim Ducks announced on Saturday. The NHL club, which drafted the left-winger in 2017, delivered the news via Twitter on Saturday, saying he'll be out of for "about two weeks." It's unclear when Comtois was hurt, but he did receive treatment for an undisclosed injury after Canada's 5-1 win over the Czech Republic on Dec. 29. 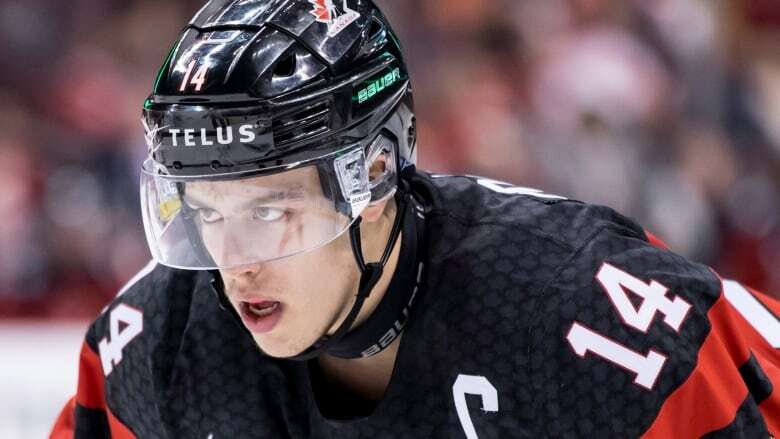 The 19-year-old served as Canada's captain for the tournament and had five goals and an assist before the team was eliminated by Finland in Wednesday's quarter-finals. Comtois played 10 games for the Ducks in October before returning to the Drummondville Voltigeurs of the Quebec Major Junior Hockey League in late November. The governing body of world hockey is considering playing all international games on smaller surfaces. Rene Fasel, president of the International Ice Hockey Federation, believes the tighter rink size used by the NHL can make for more exciting hockey. "More and more now when we are watching the games, especially the juniors here in Canada, maybe one of the reasons the tournament here is on a very high level, maybe, is the size of the small ice," Fasel said Saturday before the medal games at the world junior hockey championship. The standard NHL rink is 200 feet by 85 feet. The international standard is 197 by 98. Hockey was played on an NHL-sized surface at 2010 Olympics in Vancouver because the cost for creating a larger surface was too high, Fasel said. "So we decided to play on small ice in 2010 and that was an exceptional tournament," he said. "When you speak with the older guys in Europe, they are maybe not so much in favour. But we maybe need that change." The organization is mulling smaller rinks for the world championships in Finland and the Beijing Olympics, both in 2022. "That should be our goal, that in the future we should have the same size that we have here in North America," he said. Next year's world junior hockey championship is in the Czech Republic, where the larger surface will be used.